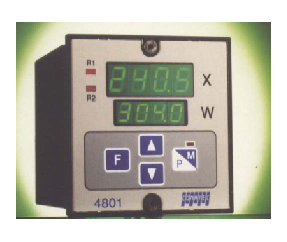 Programme regulator configurable by keyboard designed for all processes which require actions on contactors, servovalves without repeater and continuous outputs. Storage of 1 programme with 6 steps. LED display the control output action. - Thermocouples J, K, S and B. - Pt100 thermoprobes, Ni200, Ohms. - Analogic signal 0-20 mA, 4-20 mA, 0-10v or 2-10 v.
- Relay direct or inverse. - Double relay for servo-motor without repeater. - Analogic 0/20 mA. 0-10v. - Analogic 4/20 mA. 2-10v. Absolute, relative or band configurable alarm for the control outputs relay. Output 0/4-20 mA image of the input signal when not using analogue control. Maximum load for outputs mA with 500 ohm. Maximum consumption for outputs 0/2-10 v with 10 mA. 230 VAc +/- 10%. Consumption 8 VA.